The history of the transit systems in the Twin Cities of Minneapolis and St. Paul make a very good example of the evolution of the trolley. They had their horsecar railway, cable railways, electric railway, and electric railway with a counterbalance, and they experimented with other means of power such as a "soda motor". As well they had quite a variety of cars, including double-decker electric cars - a car that never really gained popularity here in the U.S. In St. Paul the first horsecar line opened as the St. Paul Street Railway on July 15, 1872. The St. Paul Street Railway was on a shaky financial footing from the beginning and after having changed hands several times in those early years finally went bankrupt and reemerged in November of 1877 as the St. Paul City Railway Company. While it might be argued that there were horsecars hauled by small steam locomotives prior to 1867, the first horsecar railway in Minneapolis, the Minneapolis Street Railway, began service on September 2, 1875. It was built to a 42-inch gauge and later converted to standard gauge. Lines in both cities were extended and new lines opened and eventually this would all become the TCRT, the Twin Cities Rapid Transit Company. Bowing to political pressures both the MSR and the SPCR converted or built cable car lines. This turned out to be a very poor decision because of the improvements being made in the electric trolley. In St. Paul the cable lines were financed by issuing long-term bonds, bonds that would run for a lot longer period of time than the cable cars ran. In 1887 St Paul built two cable lines, the Selby Avenue line and the East 7th Street line. The Shelby Avenue line only ran as a cable line for 11 years before being converted to electric operations and the East 7th Street line only ran for 4 years before being converted. A few years following, in Minneapolis, the idea of converting their horsecar railways to cable railways was also in the mind of many and the city council forced the MSR to begin conversion. At this same time, 1889, an experimental electric railway in Minneapolis was proving so successful that the city council agreed to allow MSR to convert to electric rather than cable, before the MSR had invested to heavily in a cable system. The MSR's first line converted to electric was the Fourth Avenue South line, late in 1889 and St. Paul's first electric line was opened in early 1890. There were also several interurban lines that ran to and from the twin cities. One of these, the Minneapolis, Lyndale & Minnetonka, was using steam dummies for power, which the citizens objected to, running on the city streets. This line was one of V an Depoele's early installations of his electric system and it opened it's electric service on December 31, 1885. This electrification didn't work well and lasted about one year. At that point the railway turned to a "Soda Motor" locomotive for power. Baldwin built four of these 2-4-0 for the ML&M for use on the line from downtown to Lake Harriet. Note: referred to as 2-4-0 soda motors, as I view photos I think they ought to be called 0-4-2 because the pilot is on the driver end, where the control lever is. These soda motors didn't work out very well either and they were eventually converted to conventional steam engines. The line was also converted back to electric. As mentioned earlier most of the area's lines became part of the Twin Cities Rapid Transit Company. As with many other companies, the TCRT was also involved in the operation of parks and excursions in order to promote the use of their lines after normal working hours but what's makes the TCRT a bit different is that they also owned acreage on Big Island where they operated an amusement park and picnic grounds and they even owned the steam boats to get the people to the island. They owned a hotel on the Island as well. Also somewhat unique to the TCRT was the use of double-decker trolleys. These cars were built in the company's own shops in the early 1900s but were converted to conventional single level cars in 1909. During this period in time there were many car companies building trolley cars but quite a few of the larger trolley companies built some of their own cars as well and TCRT was one of these companies though their car building was also referred to as Transit Supply Company. I say that because the company's car roster shows car #1267 as being built by TCRT in 1907 but the Seashore Trolley Museum's roster shows TCRT car #1267 as being built in 1907 by Transit Supply Co. The PCC cars made their first appearance on the TCRT in late 1946. Though ordered in 1944, from the St. Louis Car Company, the order was delayed. Busses were in the twin cities area in the mid 20s and they slowly took over the trolley lines but it was not until June of 1954 that the last of the trolley lines were abandoned. In the early years there was a counterbalance operating on Shelby Hill. 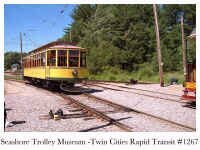 I can't find a lot of information on it but there is an interesting picture in the Twin Cities Transit Pictorial showing car #28, originally built in 1890 as a cable car but was later converted to a grip/electric for use on the Shelby Hill counterweight system.